Before you can build something, you have to destroy something first, especially in the construction industry. Whether you are renovating, or you want to run some few wires and piping, you have to demolish first, before you can build. Jackhammers are best suited for demolition jobs unless it is a job that calls for 100% teardown that can be completed by bulldozers, or explosives. Otherwise, you have to engage work persons with the appropriate tools which is often the case. Jackhammers not only make demolition jobs faster but safer and increase efficiency. Properly guided, it will make quick work of most durable surfaces, i.e., concrete, and bricks, and can prevent unnecessary demolition as it is precise thanks to the pointed tip or flat chisel-shaped plane. Traditionally, jackhammers were not for the weekend warriors or home improvement projects. They needed a large air compressor to supply power and were expensive. Thus they were used by large construction companies. However, technological advancements have resulted in a more affordable, electric apparatus that you can run out of a standard 120V socket. They are also easier to handle for a DIYer. Nonetheless, the question is how do you ensure that you are getting top value for your money? You can easily be swindled as there are many units in the market. However, through the course of this article we will look at the things to consider when purchasing a jackhammer, and the ten best jackhammers currently on the market. The unit has an input motor of about 220W and thus packs a punch. Moreover, it is compatible with many outlets as it uses a 60HZ/120V voltage. Therefore, it is the best for renovations and weekend warriors. Another fascinating feature of this unit is the 1,900 BPM (blows per minute) which is on the higher end. Furthermore, transporting the unit will be a breeze as it includes a blow molded case. Though the crate is plastic, it should last with proper care. Included in the kit also is 1-1/8” flat chisel and 1-1/8” bull point chisel. You also get an oil feeder, a hexagon bar wrench to tighten the bits, a safety mask, goggles, and gloves. Nevertheless, our best features were the ergonomics and versatility. 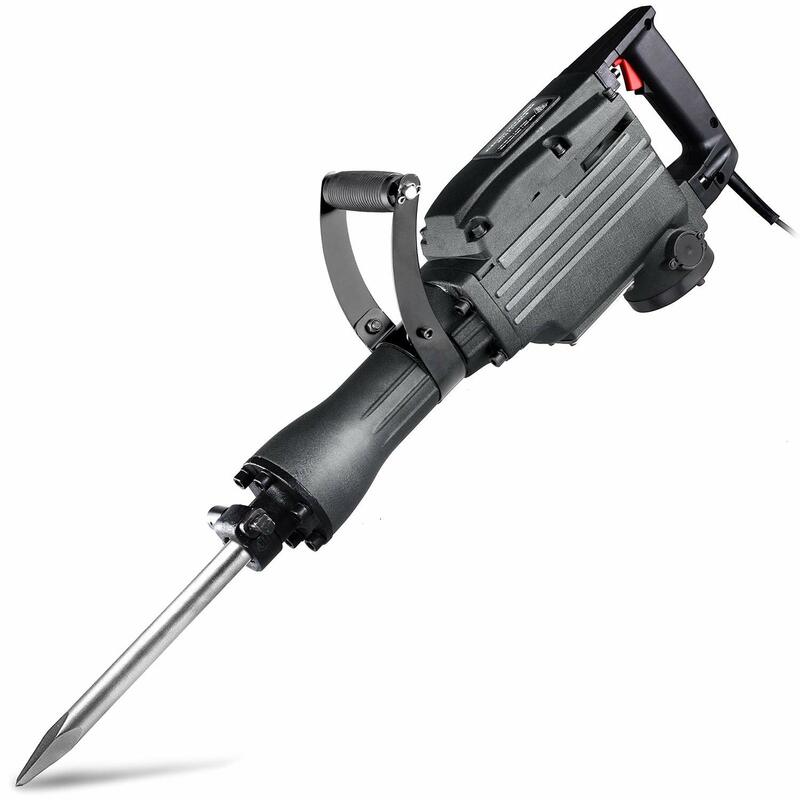 Ergonomics – The XtremePower US Heavy Duty jackhammer is designed to be effortless to use. First, it only weighs 33 pounds and suitable for everyone including ladies. Moreover, it features a plastic ergonomic handle that absorbs vibrations. This ergonomic handle coupled with the anti-vibration system ensures that demolition is a pleasant exercise. Nonetheless, you will still feel it on massive projects, and that’s where the gloves come in. There is also the improved weight distribution that helps with vertical and horizontal applications. Versatility – Other than the included bits, the XtremePower is designed to handle a myriad of applications. First, there is the speed control feature that enables you to work on delicate and heavy-duty projects. The rotating chisel, on the other hand, locks into different positions allowing you to work at different angles. There are some precautions when using it. Always ensure it is grounded when you are not using and fill up the oil before a project. This is a remmmarkable unit for light and medium duty tasks. Moreover, it is a lightweight unit and one that’s designed for use by everyone. First, it is reasonably priced, and we recommend it for weekend warriors. Nevertheless, there is nothing cheap about this unit. You will appreciate the ergonomics as they make this a comfortable apparatus to use. The unit weighs 31 pounds and can be used by all persons including ladies, and the handles are plastic to absorb vibrations. What piqued our interest though was the 360® swivel auxiliary handle that you can rotate and lock in any position increasing the versatility of the unit. Installing the bits is as easy as slipping them into the head, and locking into place. Moreover, you will appreciate the 6.5’ power cord as it gives you fantastic reach. Included in the kit too are a pair of suede work gloves, goggles, a hex point chisel, and a flat chisel, and an extra pair of carbon brushes. Also, this unit is compatible with any outlet as it uses a 60Hz/120V outlet. The required power is 1240W or 11 amps, with a 1,800 BPM, and pumps out 45 impact joules. Our best features though were the continuous operation and safety. Continuous Operation – There are instances where you want to work on a specific area, and the constant operation of the TR89105 allows you to do this. Press the trigger, and hold the lock button. To release, squeeze the trigger. Safety – TR Industrial units are known for their safety, and the 89105 is no exception. It is ETL listed by Intertek which is recognized as an Elite authority for safety testing. Moreover, the plug is double insulated to protect you from electrical hazards as it ensures the wires are rarely exposed. We recommend the TR89105 for light and medium-duty projects. Also, it is exceptional for ladies looking for a jackhammer. If you don’t mind operating a large device, we recommend you get the Neiko 02845A. Weighing a 49.2 pounds, it is heavier than most top units here, but it comes with its perks. First, you will appreciate the accessories included in the set as the unit has a point chisel and a flat chisel. It also includes an oil container, three wrenches, and a safety protection kit that consists of goggles and work gloves. The unit to packs quite a punch with a 45 Impact Joule, and a 1,800BPMand it runs on an 11.3 amp motor. The kit also includes a blow molded plastic case with wheels for effortless transportation. Other than the specs, you will appreciate the ergonomics starting with the tether speed grip. You get a better grasp, and reduced fatigue as the handle absorbs vibrations. Furthermore, the 360® auxiliary increase your flexibility as you can rotate it and lock on your favorable position. Helical Gears – Unlike other units that use spur gears, the 02845A uses helical gears that not only last longer but have quiet and smooth operation. The result is that the 02845A is comfortable and pleasant to use. Quality Construction – The Neiko 02845A is all metal construction (thus the weight) and is made with industrial grade metal. It is therefore built to last and is even coated and features industrial sand-blasted powder coating finish that protects it from corrosion and rust. 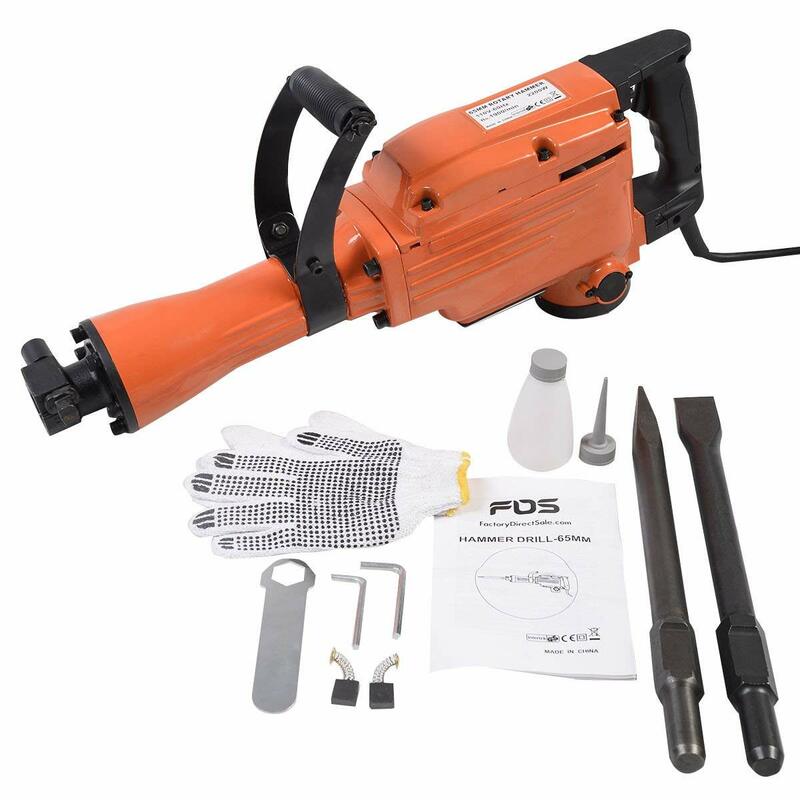 This unit is an electric device and is designed for DIYers looking to handle more demanding demolition jobs. 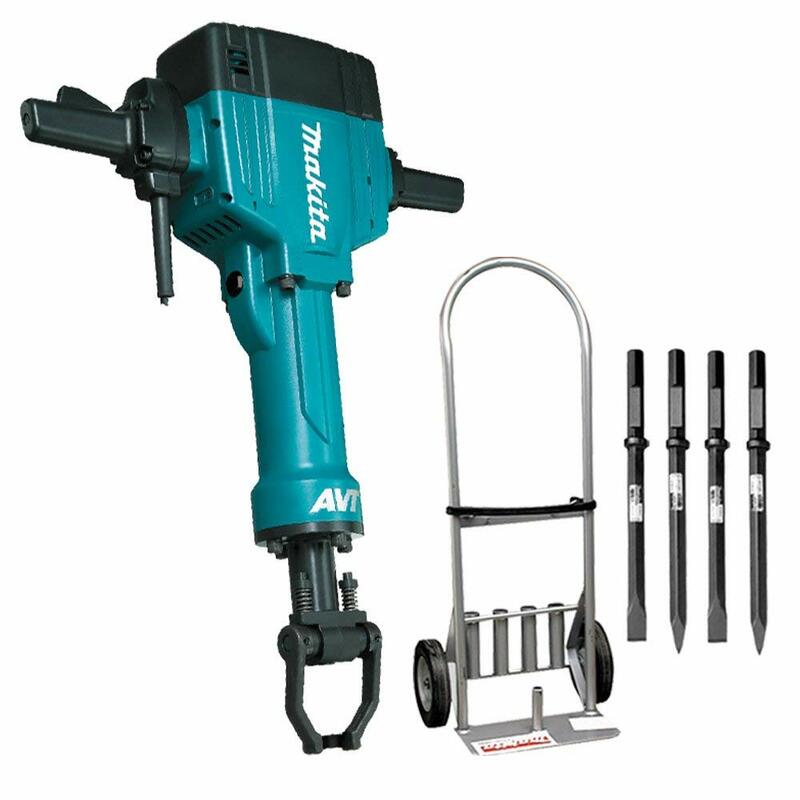 Makita is a Japanese company and is renowned for making top quality tools. The HM1810X3 is no exception and is built to last. However, all this comes at a high price, and thus we recommend it for professionals. 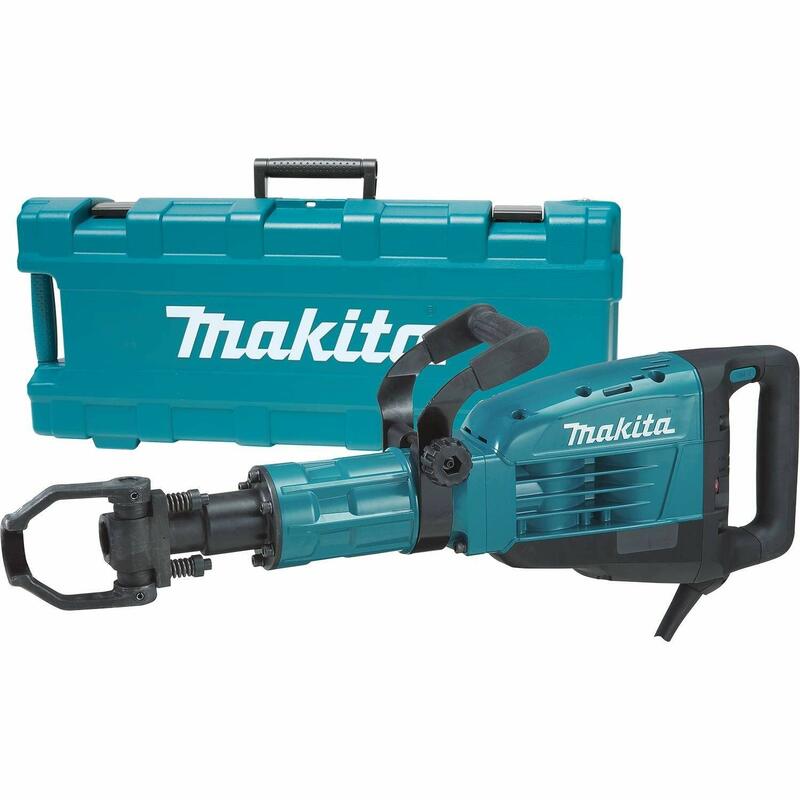 The Makita HM1810X3 is a heavy duty tool and will make quick work of any demolition task. First, it has an AC/DC switch that enables you to work with any current. It also features a powerful 15 Amp motor and provides 63 joules of impact energy. As for the BPM, expect a 1,100BPM that gives you more control over the unit. You will also appreciate the LED power light that indicates if there is a light failure, or the cord is damaged. Moreover, there is the automatic brush cut-off that is designed to protect the commutator from damage leading to a longer life. You will also appreciate that it is 30% faster than most units owing to the 63joules of impact energy. Moreover, serviceability is a breeze as thanks to the cylindrical tool holder. Our best features though were the anti-vibration tech and how quiet the device is. Quiet – When working in a residential area, you want equipment that keeps noise at a minimum. We recommend the HK1810X3 thanks to its smooth operations. It produces 107 decibels, and though it is still loud, this is way better than most other options. Couple this with noise-canceling headphones and using this piece of equipment will be a breeze. Anti-vibration tech – This unit is a heavy-duty gadget, and you can expect to feel it. However, it uses an internal counterbalance system to direct more impact energy to the ground or work surface. As a result, you have better comfort and productivity. Again, this is a tool for professional renovators and contractors. The 11335K model is one of the best in the market. It is a heavy-duty tool but one that only weighs 35 pounds and one we would recommend for any professional or rental companies. First, it is built to last. The all metal construction ensures that the unit can withstand abuse. Couple this with the inline design and you have a device that will serve you for more than a decade. For better control, the 11335K has a low 1,300BPM that increases the precision when working on thick slabs. The ergonomics are another fascinating aspect of this unit. The padded handles absorb the vibration increasing comfort, while the 360® degree auxiliary handle gives you more control at angled, horizontal, or vertical positions. Moreover, the versatile bit retention allows you to work with a 1-1/8” hex bit and an air tool steel bit. Couple this with the self-sharpening steel bit and you have a powerhouse in your hands. As for the included accessories, you get a grease tube, a cleaning rag, a pointed chisel, and a carrying case. The carrying case is designed to hold various accessories, and it has wheels for better portability. Lock-on switch – For continuous operation, the Bosch 11335K features a lock on switch that prevents any accidental shut-off. Performance – The 11335K is the best performing unit in this class. The removal rate is 50% higher compared to other tools in this class, and the vibration is 40% lower than its closest competitor. Also, it hits 33% harder than other units making removal a breeze. Given the hefty price tag of the 11335K, we recommend this unit for renters and professionals. 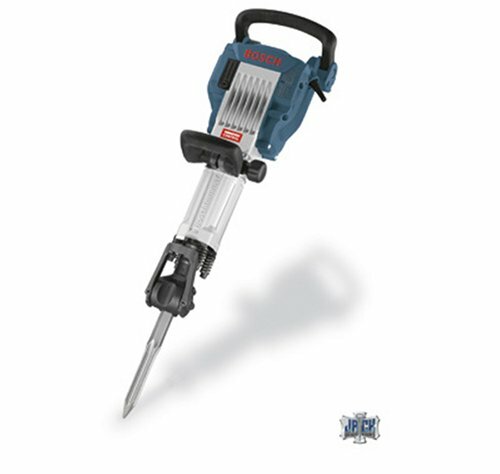 It is designed for light to medium duty tasks, and thus great for a DIY enthusiast. First, you will appreciate how user-friendly this unit is. It only weighs 23 pounds, and as such, it saves your arms and back. Moreover, seeing as it is lightweight, it is more maneuverable than other units in this class. Working with it for long hours will be a breeze. You might think that such a lightweight tool cannot handle demanding tasks, but it has an impact energy between 4.4 and 18.4 feet per pound. This variability allows you to work on delicate projects with ease. The beats per minute are also impressive at 1,890 BPM. You can expect this tool to make quick work of any surface. Another exciting feature is the SDS-max bit system that allows for tool-free bit changing. Moreover, SDS bits are easy to come by, and you don’t have to concern yourself with replacements. The service minder light also happens to be a nice touch as it indicates when preventive maintenance is required. As such, your equipment can serve you longer. Moreover, the vario-lock system enables you to rotate and lock your bits into any of 12 positions for a better working angle. Our top features though were the variable speed dial and the constant response circuitry. Variable speed dial – Different jobs require different speeds for optimal removal. When dealing with light and medium tasks, say removal of 1” to 5” thick concrete, you need a high BPM. However, heavy-duty tasks require a low BPM. The Variable speed feature enables you to work on all jobs. We recommend this tool for proficient weekend warriors. Also, though it can handle heavy-duty tasks, it’s best you use it for medium and light jobs. The HM1307CB is a heavy-duty option, and we recommend it for tough tasks. It weighs about 38 pounds and thus quite maneuverable and allows you to work for long hours without fatigue. It has a 14 amp motor that makes quick work of any surface. Some fascinating aspects of this unit include the variable speed that allows you to get the appropriate speed for any tasks. You can attain a max BPM of 1450 for light and medium duty tasks or lower it for heavy duty tasks. You will also appreciate the constant speed control as it gives you consistent speed under load. The ergonomics on this unit are also surreal starting with the rubberized handles that absorb vibration. The tool also has a 360® auxiliary handle that increases the flexibility. Furthermore, you will appreciate the motor advantage as you get better energy transfer and longer life. There is also a lock-on feature that ensured continuous operation when using this unit. Our best features though were the soft start and the safety features. Soft start – To reduce start-up reaction the soft start feature gives you enough time to acclimatize to the vibrations leading to accuracy and more control. Safety features – This unit is made so that there is no downtime. First, there is the LED service light that will alert you 8 hours before the brushes need to be replaced. Moreover, there is an LED power light to show cord damage or switch failure. Finally, you get the automatic brush cut-off that prolongs life, and the hammer goes to neutral when not being used. We recommend this tool for heavy duty tasks. Another professional option we recommend is the D25980K. 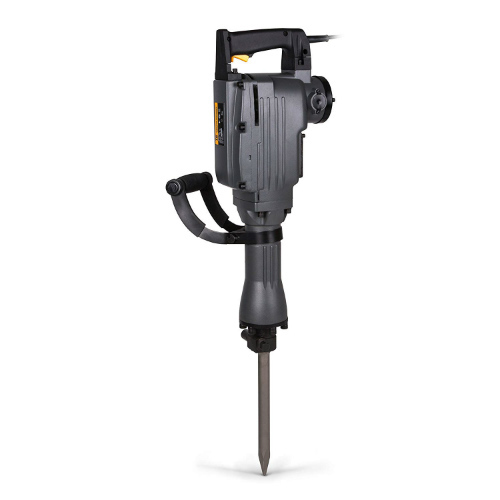 DeWalt is renowned for making professional tools, and this unit is no exception. With a 15 amp motor, it breaks down concrete or any other surface like a hot knife through butter. You can expect 61 feet per pound of impact energy from this device, and it can hammer through any surface. For portability, DeWalt included a hammer truck for ease. 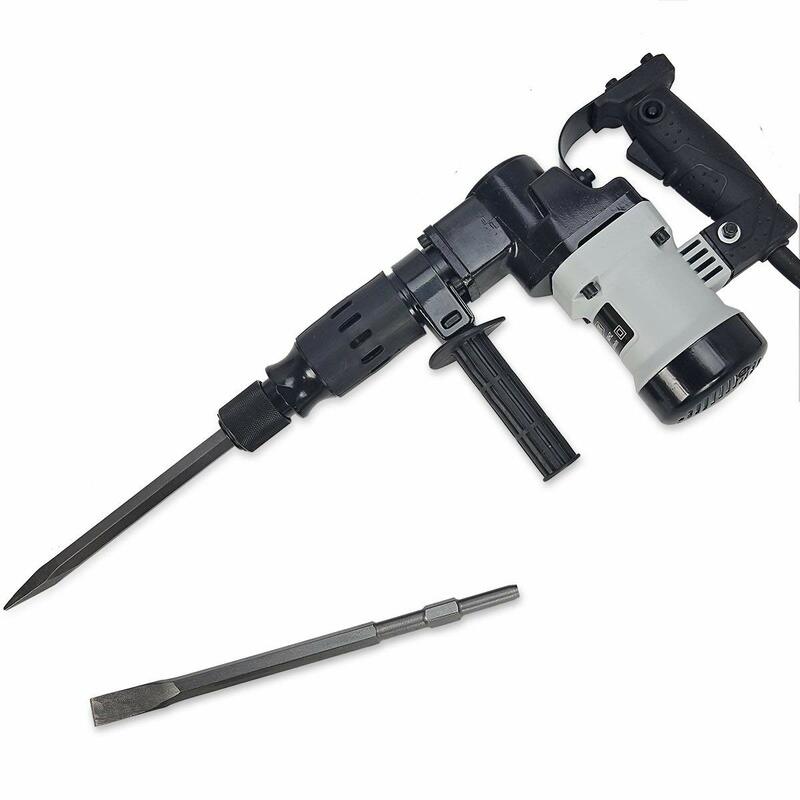 Included in the kit are the tool, the hammer truck and steel, one three-inch flat chisel, one one-inch flat chisel, and one bull-point bit. Moreover, it is an electric unit and compatible with a 120V outlet. Nevertheless, it is a large unit that we recommend for heavy duty tasks. Soft start – To protect the unit from overload and to lower your concerns about bit walking, this jackhammer incorporates a soft-start feature. It reduces the start-up reaction and increases control and accuracy. Ergonomics – The D25980K is designed to be comfortable to work with. First, it has an anti-vibration control system that suppresses vibrations. Moreover, the handles are padded, and this combination reduces vibrations by 70%. You will still need some work gloves though. We recommend this tool for renters and professionals in construction or demolition. If you are looking for a light tool to handle light-duty tasks or to work in tight spaces, we recommend you get the 1000W XtremePower US. It features a nine 1mp motor which makes quick work of any light task. Moreover, it is lightweight and easy to handle for long periods. Pair this with the ergonomic grips, and you have an excellent tool in your hands. The handles are padded to absorb vibrations. You will also appreciate the lock-on feature if you don’t want to hold down the trigger for continuous operation. Included in this kit is a blow molded carrying case and though it is plastic, you can expect it to last with the proper care. You also get a flat bit and a pointed bit. Maintaining the unit is a breeze as you are only required to change the oil once every six months. Swivel handle – Our favorite feature is the swivel handle that rotates 360® increasing the versatility. Impact rate – with a 3000 beats per minute impact rate, this tool will get through any surface. It also provides consistent power under load. Being a 1000W unit, we recommend it for light tasks. It would especially suit DIYers, beginners, and ladies seeing as it is a lightweight tool. The Goplus has earned a reputation for its efficiency and reliability. Moreover, it is a premium product at a pocket-friendly price. It is intended for both business and home improvement tasks, but we recommend it for the later. When purchasing this unit, you get a jackhammer, one bull point chisel and one flat chisel, a pair of protective gloves, two carbon brushes, hex wrenches, an oil bottle, and a carrying case. The carrying helps in organizing your tools and portability thanks to the wheels. Furthermore, the unit comes with some oil to test out the unit and thus you should fill it up before you use it. Ergonomics – The Goplus is designed to be comfortable. First, the handles are plastic and thus serves to reduce the vibrations. Moreover, the tool only weighs 33 pounds allowing you to work for long hours without fatigue. Furthermore, the 360® swivel handle increases maneuverability as you can lock it in any position. Power – With a 2,200 Watt motor and an impact rate of 1,900 beats per minute you will not lack power. You can use it for chipping, blowing out holes on walls, and trenching. Though this tool is for commercial purposes, we recommend it for the weekend warriors and home improvement. However, it can still serve as a backup unit for professionals. The first thing you should consider is the kind of unit you desire. 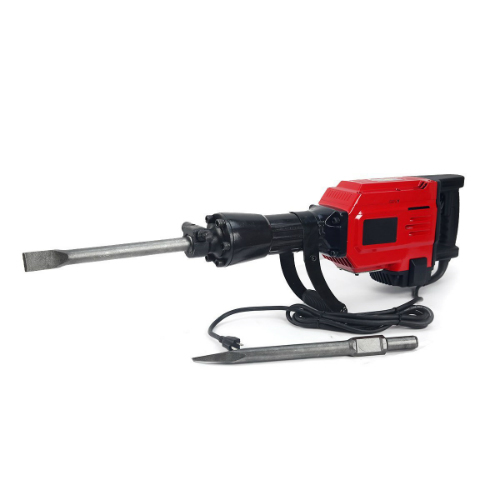 If you are looking for a DIY appliance, we recommend you get the electric jackhammer as it is easier to operate as it only needs the power cord. Electric jackhammers convert the power of an electric motor into the up and down movement of a hammer using gear mechanism. 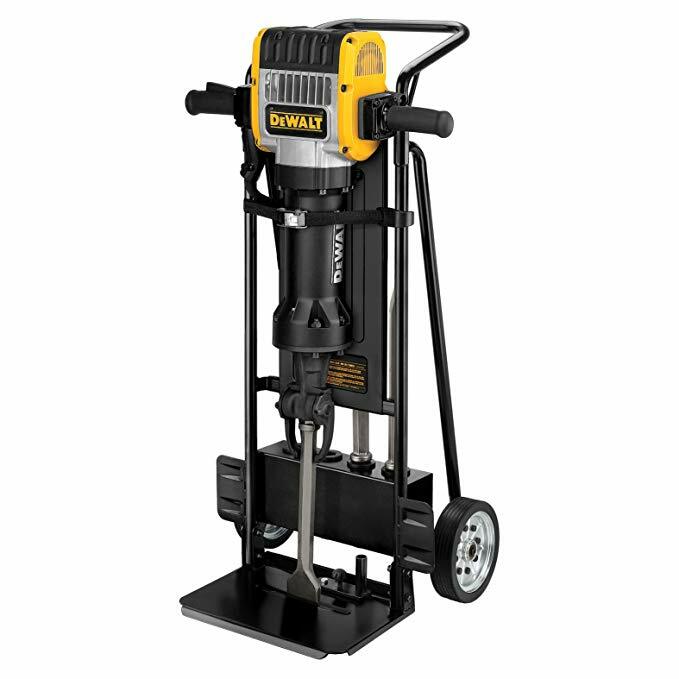 If you are looking for specialized tools, you can pick a hydraulic jackhammerthat creates a drive with oil using a piston and pump. Oil doesn’t compress, and thus it is excellent for transferring energy. Nevertheless, these units lack flexibility and are awkward and tricky to manage. Pneumatic jackhammersare the last type and use air pressure to drive the hammer. They need an air compressor for this, but they are lighter and more manageable. The impact rate is the number of strikes that the unit can deliver in a minute, also known as the blows or beats per minute. The impact rate is often between 1,300 and 1,900 and influences the ability to break through and the performance of the unit. Traditionally, jackhammers were rated by their weight. A 60-pound unit was used to break down concrete that was 6” thick while a 30-pound apparatus unit was used to break down concrete that was half that. However, these standards no longer apply. Yes, a bulkier tool will provide more force, the runtime is limited. Thus, we recommend you get a heavier unit to break down small but dense areas and a lighter tool if you are working in a large thin area. Unlike the impact rate, the impact force is the energy transmitted to the concrete with each blow. Customarily, it was measured in joules, but now manufacturers are rating this in foot-pounds. Get a unit that uses a 1-1/8” sized bit as this is the standard size. Purchasing a machine that uses a non-standard size bit can limit options when looking for a replacement. Also, consider investing in an appliance with a soft start. Yes, they tend to be expensive, but they help you maintain control and increase accuracy. Equipment without this feature tends to walk or jump lowering the Furthermore, ensure your gadget uses at least an 11 amp motor though we recommend a stronger motor for durability. You should also consider the angle you will be working at. Most jackhammers work in a vertical position, and we suggest you pick an auxiliary or side hammer when working at an angle. Finally, consider the power cord. But a jackhammer with a longer power cord as you will have more control. How complicated is maintaining jone? They are pretty easy to maintain as all that’s required is lubrication. Most of the components are subjected to force and thus proper lubrication is needed for longer working life. Failure to do this will damage the parts and result in a shorter life. Ensure you follow the manufacturer’s instructions on how to maintain your tool. Otherwise, ensure it is ever clean and store it in a dry environment. What’s the difference between jackhammers, paving breakers, and demo hammers? Manufacturers use different names for the same tool, and thus it can be confusing. Nonetheless, these terms refer to the same instrument. A paving breaker refers to the upright jackhammer that is used in roadwork and breaking up pavements while the demolition hammer refers to smaller jackhammers that are used in for lighter demolition tasks and drilling wire or pipe holes. 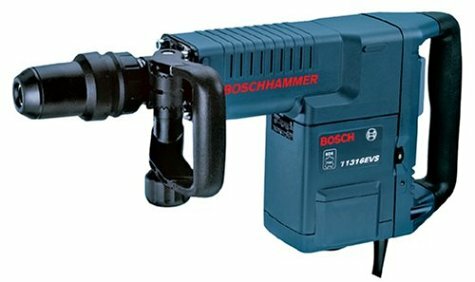 Can I get a pneumatic hammer since I already have a compressor? Well, there are some things to consider. First, pneumatic compressors are professional tools and are quite pricey. Ask yourself if you need such a powerful tool and if you are willing to spend a small fortune. Electric, on the other hand, demolition hammers will save you a ton of money, and they are quite efficient. Moreover, be sure that your air compressor can supply the required power, but most home improvement compressors aren’t capable of that. Though jackhammers are ear-shattering tools, we can’t do without them as we would have to result to sledgehammers whenever a little demolition is required. By combining a chisel and hammer, a jackhammer will save you time and energy. In the above guide, we have included some of the best options for professionals and DIY enthusiasts. Beginners can use this guide to make a purchase decision while proficient workers can use it to break a tie. Remember to stay within your budget and only invest in a jackhammer when it’s necessary. If you feel there is something we have left, be sure to let us know in the comments below.